Almighty God, who by the hand of Mark the evangelist hast given to thy Church the Gospel of Jesus Christ the Son of God: We thank thee for this witness, and pray that we may be firmly grounded in its truth; through the same Jesus Christ our Lord, who liveth and reigneth with thee and the Holy Spirit, one God, for ever and ever. 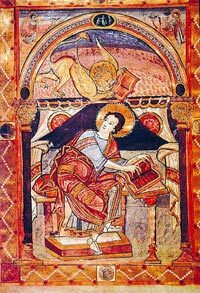 Almighty God, who by the hand of Mark the evangelist have given to your Church the Gospel of Jesus Christ the Son of God: We thank you for this witness, and pray that we may be firmly grounded in its truth; through Jesus Christ our Lord, who lives and reigns with you and the Holy Spirit, one God, for ever and ever. The book of Acts mentions a Mark, or John Mark, a kinsman of Barnabas (Col 4:10). The house of his mother Mary was a meeting place for Christians in Jerusalem (Acts 12:12). When Paul and Barnabas, who had been in Antioch, came to Jerusalem, they brought Mark back to Antioch with them (12:25), and he accompanied them on their first missionary journey (13:5), but left them prematurely and returned to Jerusalem (13:13). When Paul and Barnabas were about to set out on a second missionary journey, Barnabas proposed to take Mark, but Paul thought him unreliable, so that eventually Barnabas made one journey taking Mark, and Paul another journey taking Silas (15:36-40). Mark is not mentioned again in Acts. However, it appears that he became more reliable, for Paul mentions him as a trusted assistant in Colossians 4:10 and again in 2 Timothy 4:11. The Apostle Peter had a co-worker whom he refers to as "my son Mark" (1 Peter 5:13). Papias, an early second century writer, in describing the origins of the Gospels, tells us that Mark was the "interpreter" of Peter, and that he wrote down ("but not in order") the stories that he had heard Peter tell in his preaching about the life and teachings of Jesus. The Gospel of Mark, in describing the arrest of Jesus (14:51f), speaks of a young man who followed the arresting party, wearing only a linen cloth wrapped around his body, whom the arresting party tried to seize, but who left the cloth in their hands and fled naked. It is speculated that this young man was the writer himself, since the detail is hardly worth mentioning if he were not. Tradition has it that after the death of Peter, Mark left Rome and went to preach in Alexandria, Egypt, where he was eventually martyred. It is natural to identify the John Mark of Acts with the Gospel-writer and interpreter of Peter, and this identification is standard in liturgical references to Mark. However, "Mark" is the commonest of Latin first names, and they may well have been separate persons. Mark's symbol in art is a Lion, usually winged. In the book of Revelation, the visionary sees about the throne of God four winged creatures: a lion, an ox, a man, and an eagle. (Compare with the cherubs in Ezek 1 and 10.) It has customarily been supposed that these represent the four Gospels, or the four Evangelists (Gospel-writers). One way of matching them is to say that the man stands for Matthew, whose narrative begins with the human genealogy of Jesus; that the lion stands for Mark, whose narrative begins with John the Baptist crying out in the desert (a lion roars in the desert); that the ox, a sacrificial animal, stands for Luke, whose narrative begins in the Temple, and that the eagle stands for John, whose narrative begins in Heaven, with the eternal Word. How old this correspondence is I do not know. I have seen it in an illustrated Gospel-book from the early 800's. An alternative assignment, which I think to be far more recent, calls Matthew the lion (because he portrays Christ as the Messiah, the fulfilment of Jewish prophecy, "the lion of the tribe of Judah"), Mark the ox (because he portrays Christ the servant, constantly doing the work for which he was sent), Luke the man (because he portrays the humanity and compassion of Christ), and John the eagle (because he portrays Christ as the eternal Word, who came down from Heaven).